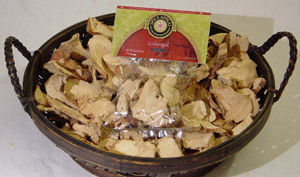 The aromatic, peppery, ginger-like spice is indigenous to Southeast Asia. Its pungent cardamom-like eucalyptus flavor enhances the overall flavor profiles of Thai and Indonesian cuisines when paired with coconut, chili peppers, lime leaves, turmeric, fish sauce, tamarind and shallots. Used in pungent Thai curry pastes, meat marinades and stir-fries. Added to Indonesian spice pastes that are rubbed on duck and fish.